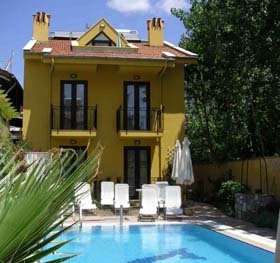 Hotel Asena Beach situated in the centre of Oludeniz,10 minutes walk from the famous beach and lagoon. All the rooms have individually controlled air-conditioning and has a balcony overlooking the poolside. 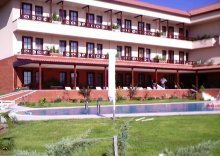 The hotel's accommodation has a Mediterranean village atmosphere comprising a number of separate two-storey blocks spaciously set in magnificent gardens. The wealth of amenities available to guests are all within easy walking distance. Starting from the 1st of June 2001, Letoonia Club Hotel sets a new standard for an excellent service in Fethiye, one of the best spots of the South Coast of Turkey, with its 24 elegantly furnished, air-conditioned rooms with 52 bed capacity, swimming pool, bar and its friendly personnel. Hotel Perdikia is fabulous location just 210 m from the famous golden sands of Oludeniz with a friendly homely atmosphere and modern comfortably furnished bedrooms at your service. Hotel Asena Village nestles beneath the mountains, a friendly hotel in a beautiful setting, The Asena Village overlooks the forest and is tranquil in atmosphere. Situated at sea-level, Ata Park hotel is by the Fethiye bay where the pines meet the sea. 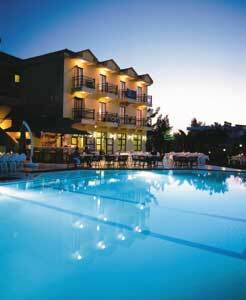 It is an integrated hotel complex with rooms overlooking the land and the sea with pool, sauna, Turkish bath and gym. The rooms are provided with direct dialing system for international phone calls, air-conditioning, satellite TV. The Inn is a truly international class hotel. A part of the Swissotel group, it features the quality and ambience our clients prefer.The Inn's deluxe room makes full use of its location within a short stroll of the village centre, with lovely outlooks from their private balconies of the marina, the bay and the Twelve Islands of Gocek. Villa Danlin Hotel Gocek Fethiye Turkey be pleased to welcome those who wish to anchor in Göcek in our charming little hotel located in the heart of the town. Holiday at Lykia World holiday means that you create your own paradise. All facilities, equipment and activities you would need to experience the holiday you long for, without suffering any frustration, in such a manner to have your expectations met, is here, at your fingertip. All Rooms with Direct Dial Telephone, Shower & Toilet, Air-condition, Hair Dryer, Sea View, Minibar, Safe, Balcony or Terrace, Radio, Baby Cot (upon request). St.Nicholas Park Garden is closer to the village's bustling centre and offers 60 rooms / 120 beds.